A pulse oximeter measures the percentage of hemoglobin in your blood carrying oxygen. It’s very simple to check your oxygen saturation with a device like this and this video shows you exactly how simple it is. 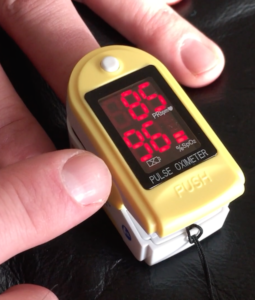 The pulse oximeter measures your pulse and also your oxygen levels. Ideally you want to be in the 90s range for your oxygen concentration and preferably at 95% or above. Anything below 90 is considered low. To turn on your pulse oximeter press the button on the top which is the side with the screen. Once the pulse oximeter is on go ahead and insert your finger into the oximeter and wait. Soon you’ll see your pulse and your oxygen readings. We’ve seen a lot of people with a readings in the low 90s and even in the 80 range which is very low oxygen saturation and means you could really use the extra oxygen an oxygen concentrator can provide. Checking your oxygen levels before you use the concentrator will allow you to see the difference getting supplemental oxygen makes, when you check your levels again during use. Having a pulse oximeter makes it simple to monitor your oxygen levels wherever you may be.